Lisa Blackmore | Imágenes del día: puros trapos sucios…. Siempre es grato cuando surgen referencias visuales que despiertan una cadena de relaciones. Hoy tuve la suerte de dar con una imagen de una obra de los artistas Christo y Jeanne-Claude, una pareja quienes han pasado cuatro décadas produciendo obras juntos. 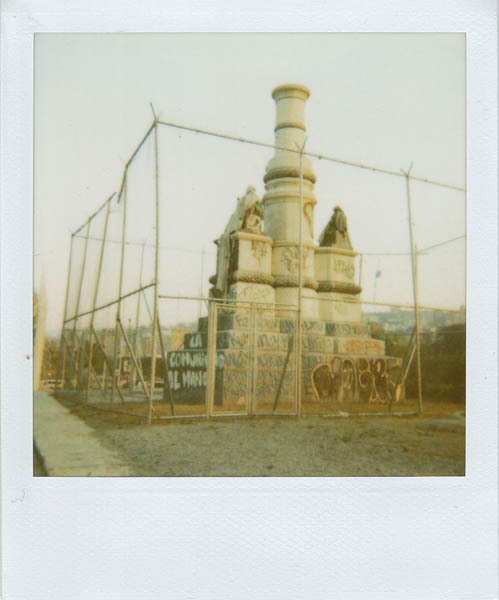 Su serie de obras de monumentos envueltos me acordó de la situación en que se encuentra la estatua de Colón en el Golfo Triste, ex abrupto urbano por excelencia. Lamentablemente, la intervención caraqueña no se propone como obra de arte. 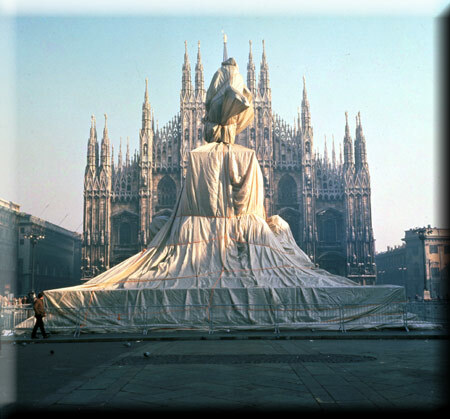 The monument to the King of Italy, Vittorio Emanuele, on Piazza del Duomo, and the monument to Leonardo da Vinci, on Piazza della Scala, were wrapped with polypropylene fabric and red polypropylene rope, in the fall of 1970, in Milano, Italy. The fabric had been sewn beforehand according to patterns, allowing ample folds. The two wrapped monuments could be seen from the center of the Galleria, simultaneously, at each extremity of the 19th century grand vaulted pedestrian shopping passageway. The monument to Vittorio Emanuele projected in front of the late 19th century cathedral, The Duomo, while the monument to Leonardo da Vinci was situated in front of the 18th century La Scala theater and the Milano City Hall. All expenses were born by the artists. The artists do not accept sponsorship of any kind. 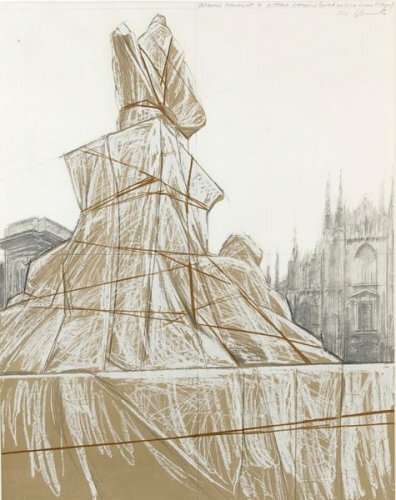 The Wrapped Monument to Vittorio Emanuele remained for two days, while the Wrapped Monument to Leonardo da Vinci remained for one week. En Noviermbre 2010 estuve visitando Milán con mi grupo Buscadores de Tesoros, y observamos la estatua de Victor Enmanuelle II frente al Duomo, así como la estatua de Leonardo Da Vinci frente al teatro La Scala, donde esa noche se presentaba Gustavo Dudamel, dirigiendo la Opera Carmen de Bizet.